Last Week of our Elf Kickstarter – FASA Games, Inc.
Production on the book is coming along at a steady pace. This week, we are inserting a handful of art pieces and finishing up the last of the photography so you can see all those sweet, sweet miniatures in detail. 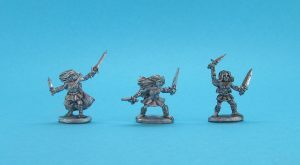 In exciting news, we have photos from Ral Partha Europe of our newest unit, the Pixie Scouts. These are the first casts, fresh from the mold and ready for battle. They’ll be uploaded to our online store soon, right about the same time the book is ready for public sale. The Centaur Warmblood units shouldn’t be far behind. I’m told there has been some difficulty gettin the weapons to cast just right, but it shouldn’t be too much longer now. Updates will come as soon as I have them. Thank you everyone for sticking with us through this process. I know it’s taken a while, but it’ll all be worth it.